There’s a downside to our modern way of doing business, procuring goods and services and working with vendors, that we don’t usually think about. When things go well, we think about the money we are saving, the opportunities we have and the speed at which complex tasks can be completed. When things go wrong, we are left to sit and wonder “where do we go from here?” We wonder that with a weird sense of dread, because, very often, we don’t know where we are. 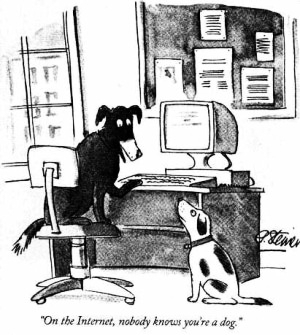 If you’re old enough, techie enough or just someone who was well read in the early 1990s, you probably remember Peter Steiner’s cartoon, that was published in The New Yorker in 1993. We joked about that caption, as the Internet was stumbling along, trying to become a thing. We didn’t realize how often the caption of that cartoon would cause us the problems referred to above, including ones I suffered last week. I spent most of last week fighting with a technology vendor that appears to be bigger than they are. It’s a complex story with a just-in-the-nick-of-time happy ending that was due to the hard work of my staff – not the vendor. I wanted to share that story, but it’s techie and boring, I’ll share another one that might be easier to relate to. Ten years ago, I wanted to buy my wife a garden cart for Mother’s Day – yes, I am just that romantic. I didn’t want some junky thing from Home Depot, so I began a search on the Internet. I found a company out west that was advertising remarkable looking carts. They were lined up on a grassy knoll with mountains in the background. The site spoke of quality manufacturing and a commitment to customer service that seemed amazing – just the kind of merchant I was hoping to find. When the cart didn’t arrive in time for Mother’s Day. I wrapped a picture of the website. When the cart didn’t arrive in time for Father’s Day. I tried to cancel the order. When the cart arrived in early July, I realized it had been drop-shipped from Harbor Freight, where I could have bought it for 50% less than what I paid. This “company” (a one-man show) existed to sell one thing, a product he didn’t make, didn’t stock and didn’t support. I couldn’t cancel my order, because he couldn’t cancel his. If you’re thinking “poor Dan” and taking comfort in the fact that we are dealing with larger, more reputable vendors today, you might be enjoying a false sense of security. There are still many companies that buy and ship products they never see. They buy them from factories in China and, in some cases, they buy them from Wal*Mart, Home Depot and Harbor Freight. They have them delivered to logistic vendors’ warehouses or drop-shipped to you while they smack your credit card as if their extended family is busy out back, fulfilling the order. They ramp up the SEO tags on a particular product, move to a good spot in the search results and make a living selling you something you could buy for less, if only you looked harder. During the Christmas holidays, my wife found a vendor selling a brand of cookie on Amazon for four-to-five times what they used to cost in the grocery store (that had stopped carrying them). She kept looking and found the cookies on Wal*Mart’s website, for the normal price. You can find these companies at their own websites, on Amazon, eBay and other shopping sites. Most of the time, the products are delivered and function as advertised. The worst thing you might suffer is learning that you didn’t buy something unique and / or you could have spent much less money if you had looked around. Although you might be dreading the thought that, due to the Supreme Court’s recent ruling, states can now force Internet vendors to collect and remit sales tax, there is an upside. That action will make it harder for some of these vendors to operate. It will also level the playing field for small, local vendors who might just be able to put your favorite cookies back on the shelf. The cactus rose is beginning to bloom. Pine cones are falling – that seems early. This guy hasn’t heard about the lady on the next street. She’s got peanuts. The carney’s rolled in last night. They’ll be ready to roll come Thursday. I’m always amazed at the way these things fold-up. I think that’s the tilt-a-whirl. Dogs, burgers and fries. Off to the left will be hot sausage. One week to go. I hope these blooms hang around a bit, I need a better picture. The cactus rose is getting pretty. I’m still looking for the perfect one, but I like this one a lot. The sun is trying to burn through, but it won’t make it today. I love the cactus flowers. Your best sunlight for them is definitely sunrise or dusk. Yellow is a tricky color to photograph. That is a lovely photo. Your dandelions are getting better all the time too. I hope you have a great week, sans techie trouble. Thanks Cheryl. I learned that lesson when I had my cabinet shop. People want higher quality and unique craftsmanship, but most don’t want to pay for it. The cactus rose gave me a hard time. They looked better on the LCD of the camera than they did when I offloaded them. Hopefully I’ll get a second chance. The dandelion (flower) was nearly perfect. I took a couple shots of that and I liked this one. Have you tried adjusting the color and light in your photo editing program? Not much. Being colorblind makes that difficult. I try to get these right in the camera. I might try a different setting. You hit some hot button this morning, Dan. Most important is that when the Editor needs a new gardening cart, please check out this one: https://www.hardwarestore.com/ames-true-temper-garden-cart-total-control-5-cu.html. A friend had it, hauled it around in her car, I used it, and went directly to Aubuchon to buy it. I’ve had it for two years, and it is the absolute best cart I’ve ever owned. Why – because it moves so easily, steadily, and I can pull most things with one hand. Because I’m somewhat computer savvy but not like you, I do my research and then from a local box store so I can return it with no problem. I know it is trendy to have things delivered to your step, but I’ll go pick them up because then I can return them. The tax issue is like everything else – good and bad. A family member has a very nice store on Etsy and that is her main financial support so I worry that this tax issue may put her out of business. Oh well, lots to think about on this Monday. Hope you have a good week. Thanks Judy! It turns out the cart was a bad idea anyway. I was buying it to help her move firewood. Later, that year, she bought the firewood cart she wanted and I sold the garden cart to a friend who wanted one. The sales tax is a mixed bag, but I feel bad for the local small stores, particularly given CT’s high tax. With the ease of internet shopping these days, no more Black Friday and Christmas Eve hysterics, I think most of us can relate to your story, Dan. I just hope the wife was happy with her gift once she got it!! But the story had a happy ending. She bought the cart she wanted. I sold that cart to a coworker who wanted it, and was happy to have it assembled. I try to shop local as much as I can, but some things are just not available in a store any more. I once found a funky Christmas sweater on line from an American site. When Customs called me and said I owed more money (almost 50% more) because it was coming from China, I got cranky! I tried to cancel and was told no. When delivery showed up at my door I refused it. As long as I didn’t touch it they couldn’t force it. I called the website and they said the problem was mine and I should have know better!!! I got some money back and learned a valuable lesson. BUYER BEWARE! These are lessons learned the hard way. It makes me angry when I think that there are people who make their living tricking customers into paying more for things that aren’t what they seem or that could be purchased for much less. But, that’s the only time it has happened to me, so maybe it was worth it. Thanks for sharing your story! Awful story. Beautiful photos. The cactus are gorgeous, and I always love the running commentary of those baseball birds! Thanks Lois. The birds are finally back. They had disappeared for a few weeks after the fields were sprayed – nothing to eat I suppose – but now we’re bag in the bugs. Do you like your little fair for anything other than the hot sausauge? Beer, perhaps? Thanks for the heads up, Dan. I’ve been fortunate, so far, that I haven’t had your vendor type of issue. I prefer to purchase online from companies I know, at a price that I consider reasonable. I’ve done well, lately, with getting otherwise expensive shoes for a great price. I still prefer going to the store to shop in person and be able to see, feel and/or try on what I’m buying. We do a mix of online and in-person shopping. My wife has several trusted places online that she uses. I try to support the local hardware store and tool suppliers, even though they are a little more expensive. I like to be able to see how something feels in my hand, and I don’t mind paying a little more for that. I say go get your hot sausage and have a Coke. Save the beer for the bar and when you’re not working with tools. The internet is very much like that wizard of oz guy behind the curtain. pay no attention to him. and pay no attention to that small dog doing strange things to his ankle. is today monday ! pay no attention to that either. happy un-monday Dan. Happy UnMonday John. I try to be careful what I pay attention to, but it gets crazy sometimes. The other side of that coin were the scam artists who suckered people into a dream of “just sitting back and watching the money roll in.” The cost was a ridiculously expensive e-commerce site that sold discount items for a marked up price. I think I’m less sympathetic to scammers getting scammed than I am the downstream customers, but you’re right, I remember some of those schemes being advertised. There’s always someone trying to separate people from their money. I think playing middleman is the way a lot of “Internet millionaires” are making their fortune. Find a product, make your own website, SEO the crap out of it, charge twice what the manufacturer does, then sit on your big rear end and pretend you’re the person who ordered from you and order from the manufacturer. No one’s any the wiser. Great work if you can get it, huh? It is still going on, but it’s getting easier to find better deals. I’m beginning to question the first page of search results. I have never ordered anything online. I am truly a dinosaur! I prefer to shop in mom and pop stores, but there are less and less of them. So I will go to a WallMart or Lowe’s where I can see exactly what I’m buying and after I haul it home, if I regret the purchase, they take it back, no questions asked. I just LOVE the cactus rose!! I sure hope weather is perfect for the Fireman’s Carnival or you’re gonna be one very disappointed kid! Lol. Looks like they’re well-prepared. Hope you and the Editor and the fur balls get through the approaching heatwave with no problems. Still beats winter in my book! Thanks Ginger. I prefer shopping in the store, but there are fewer opportunities to do so for some items. I would actually prefer a smaller store, but those are even harder to find. I hope to get a better picture of that cactus rose, either on my way to the fair or on an early am walk with the queen. The carnival runs for three days. Those are pretty good odds that I’ll get fed. I like it to be successful for them. They are a great volunteer group. I usually shop online at Wal-Mart and pick up the order that same day. Other than that, I do most of my shopping in the store itself. Makes me feel less anxious that way! We have some trusted online sites, and we shop locally. Even there, we gravitate to smaller stores if we can. I’d like to keep them in business. The online shopping trend has grown in India as well and now Walmart is entering the market. However, I still prefer to buy things offline. Yes, I try to shop few things from selected sites that I trust, but I love shopping in the real world. I and Sarah go grocery shopping and we enjoy it. We go to a shopping mall, try out clothes and look through options and we make the best use of our time. I won’t give up my happiness for few extra bucks of discount. I like that approach. It’s good to hear. You hit the nail on the head! Guess we all have stories that we wish didn’t happen. End of last year I made the big purchase of a lens that everyone acclaimed was to die for; did my net research and finally took the plunge from a mail order company that I did business with over 30 yrs ago. Black Friday sales brought competitive pricing down to $20 difference from reputable companies and I thought I would save 20 bucks but the vendor waited til past the weekend then called to “verify” my address and then slipped in the, I just noticed you’re buying a gray market lens when you purchased OEM before and if I wanted an OEM please add $200. Told them of the othe BF deals and they said they would price match but as usual the BF deals expired over the weekend and there nothing to match anymore. I complained bout the bait and switch so they gave me some cheap filters to sweeten the poison pill and after I got the lens I was still angry so I posted a bad review on Better Business Bureau (found another sucker review then); got an immediate call back from the sales guy and he offered me a couple additional items if I corrected my review. Did my good faith correction and they didn’t ship the other stuff until I complained again and the guy told me shipping messed up the order; yeah, like he was dealing with a hayseed! Told them to correct their deceptive ads and he gave all kinds of excuses why they couldn’t and told me if you looked closely and compare ads with others you should see the (subtle ) diiferences – not true cause you can’t read tween the lines when lines don’t exist. End of story, buyer beware and they lost a 30 year customer and hopfully people saw my BBB review cautioning the company to post better ads. Whew, got me worked up; good thing your photos were really nice to get us back in the right frame of mind. Have a great week! Wow! That is a horror story. You would think they would want to make it right. Some places don’t seem to care about reputation and loyalty. Others do, but you never know. It pays to explore. Great post, I can relate. Pine cone and dandelion my favorites. Judging from the comments, we’ve all been here or near here. I’m glad you like those two pictures, I actually worked a little to get them the way I wanted. Thanks Val. I like to make sure the photos offer something to bring the BP back down. I hope to be able to try again. I have come to believe customer service is an oxymoron. It is s hard to find it these days. Lovely photos, Dan I like your dandelion shot. Thanks John. You might be right about that. It’s such a remarkable treat when I find it. I’m glad you like that picture. I don’t think you will get a better one. Thanks Hillary. I tend to stick with places that treat me well but sometimes I’ve found that it was the person, not the company. Like you I’m getting a bit wary shopping online, and tend to stick to a few stores that I trust. But the only time I was sure I’d been ripped off (no acknowledgement of my order and payment, no goods) it was seemingly my fault for not hitting the right button (no sign of the purchase on my credit card). Not a red face but a pinkish one. Everybody makes mistakes. I’m ok as long as they aren’t deliberate acts. I was told, that for example, a vendor makes fake DVD players that don’t work. Sells them to Wal Mart, Wal Mart sells them to you. You take it home, it doesn’t work. You take it back to Wal Mart, get your money back. Wal Mart throws the DVD player away, and writes the loss off on their taxes. The manufacturer is never held accountable. I hear good and bad things about WalMart. We don’t shop there a lot, but sometimes the difference in the price is too much to pass up. I’m less sure about Amazon, especially when it’s an independent seller selling through Amazon. I worry about vendors who seem driven to put their competition out of business. I got this thing, cause my son told me too, called “Honey” and “Honey” checks my online prices. I like it. I think it might even be worth the seconds I lose using it. Ten years ago, I didn’t shop on the internet. I was too scared. I don’t shop a lot online but comparing prices seems necessary. The garden cart found a good home. A coworker wanted one but didn’t want to have to assemble it. We made a nice deal for both of us. Your catcus flowers are gorgeous and you knocked that Dandelion fuzz ball outta da park! One week to go! Is this the place that does those Lobster Rolls too? No, no lobster rolls here. The cactus is at a woman’s house up the street. I like how it just sits there all year, waiting for these days. Thanks for you comment on the fuzz ball. Well said, Dan. Your story paints the whole picture from everyone’s perspective. Beautiful flowering cactus! Have fun at the fair this weekend, and please post photos. Thanks Jennie. The fair is s tiny little thing but I like supporting the volunteers. This line made me smile because I’m a person who is genetically programmed to always look harder for a better deal. It does pay to look around and check prices. I don’t normally get too carried away, if the prices seem reasonable, but sometimes, they just seem wrong. It amazes me when I see the same item for significantly different prices. I hope they get your return. This is a good cautionary tale, Dan. The internet has made shopping both more convenient and riskier. Thanks Joanne. It’s always a brave new world. I like the idea of the playing field being leveled — if even a tiny bit — for local vendors, my friends and neighbors who are finding it more and more difficult to keep their doors open and, oh, I love dropping in, buying a little something, and chatting with them; something I don’t enjoy in my relationship with Amazon. I do hope this helps the local guys. We are down to one local hardware store, and it gets harder for them each year. Shopping there is as you describe. As much as I love what the Internet brought us in terms of easy communication, I’m very old fashioned when it comes to shopping. I buy in person in a store. But my husband, also a big romantic, doesn’t like ‘real’ shopping and shops online all the time. Particularly for garden items that he offers me. His bird feeder shares your garden cart’s story. Possibly the same company or a sibling. It gets really hard for small businesses of all kinds to survive in this wild global world. I do my best to buy independent whenever possible. It doesn’t always mean Made Locally, which I’d rather support. What is sad is that the poorer geographic areas and neighborhoods miss totally on this option. The upscale cities and neighborhoods are the ones with locally owned shops. What scares me is when Amazon will be the only shop and the only stop. Do you see this coming too? I do, and I’m trying to postpone that as much as possible. Amazon is one thing but all the people selling through Amazon are somewhat scary. You really don’t know what you’re dealing with. I try to buy local when I can. I bought my wife a “copper” bird bath that hung from a tree branch. Within a year it rusted. So, I guess it wasn’t copper.